There’s something elegant and simple about the cover: an off-white background almost like a blank piece of paper, and then these brightly-colored typewriter keys hovering over it as if to spell something out in code. 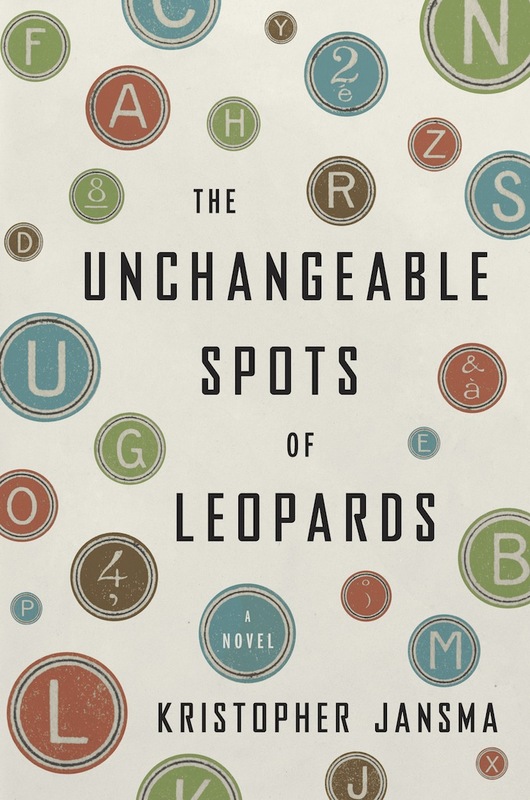 The “spots” give some context to the title, and at the same time they draw a browser’s eye in, they subtly indicate the novel’s focus on writing. Even better, there is a real connection to the plot: in a late chapter in the novel, the narrator struggles to write on an Icelandic typewriter which has several unfamiliar keys—and on a typewriter or a keyboard they are not mere “buttons” but keys. I’ve always loved that. As if they unlock something, which they do, of course. 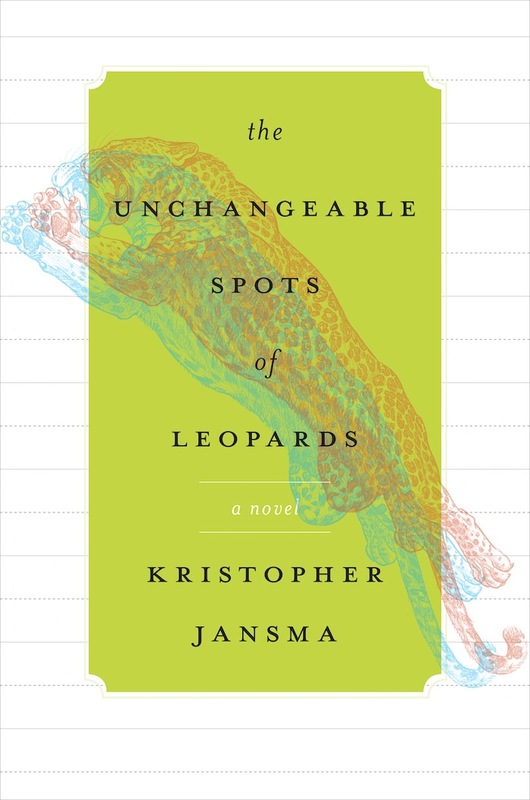 The fractured pattern that Forner created mirrors the structure of The Unchangeable Spots of Leopards, a novel told in pieces which connect in all kinds of dazzling and surprising ways. It reminds me, in this way, of the two works of art that inspired the book, and which I sent to my editor along with other thematic images I’d collected, early in the editing process. 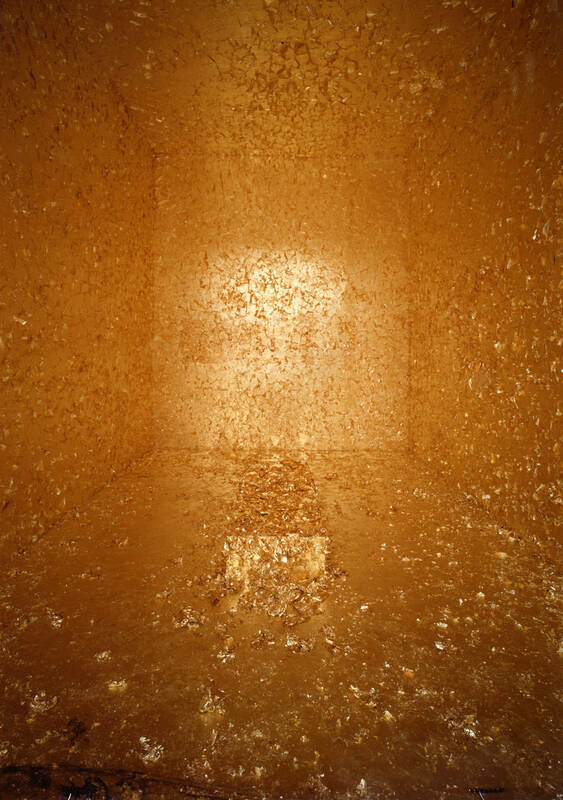 In January of 2009, the same year I began writing the book, I went to the Guggenheim Museum’s exhibition The Third Mind: American Artists Contemplate Asia and was struck immediately by The Death of James Lee Byars, a small room which is covered completely with gold leaf. It feels like a crypt and yet the room itself feels almost alive, as the curled and frayed edges of the gold rustle gently as people pass by. I didn’t know anything about the artist, James Lee Byars, at that time—but it struck me as both playful and serious, opulent and ephemeral at once. I tried to carry that tone and feeling through the novel, and I think Forner captures it perfectly in her cover. The other image that I studied was just up the street from the Guggenheim at the Neue Galerie: another artist working in gold leaf, Gustav Klimt, and his astounding Portrait of Adele Bloch-Bauer I. Worth $135 million, it was the most expensive painting sold when the Neue acquired it. 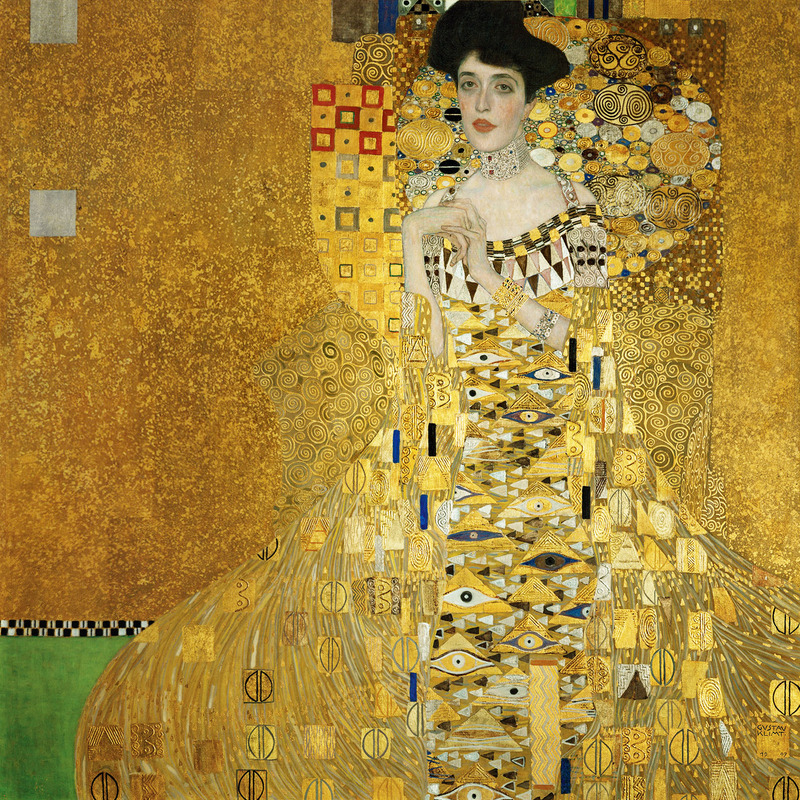 The Viennese woman in the portrait wears a golden dress which is made of patterns and patterns of patterns, including many bright spots and golden eyes. It is so intricate and would resonate with the African Kente cloth patterns I would see on my visit to Ghana the following year. Initially the Klimt inspired my idea for a much smaller and simpler golden portrait which is central to the plot of my novel, but I love the way that Forner’s cover design reminds me of the intricate swirls and spots on the Klimt painting. While I sent these images and others to my editor at Viking, I don’t actually know what influence, if any, they had on Forner’s jacket design. I like to think that the visual concepts that inspired me in writing the book are still present under the surface of the page, and that Forner almost reverse-engineered them after reading the story. But in the end I left it entirely up to her, and the good people at Penguin. I’m a writer, not a graphic designer or a painter or a interior designer…I don’t know anything about marketing or what makes readers’ eyes fly to a certain book on a shelf full of options—I only know that they will likely pause on this one. After they pick it up and turn the first page…then my job begins. 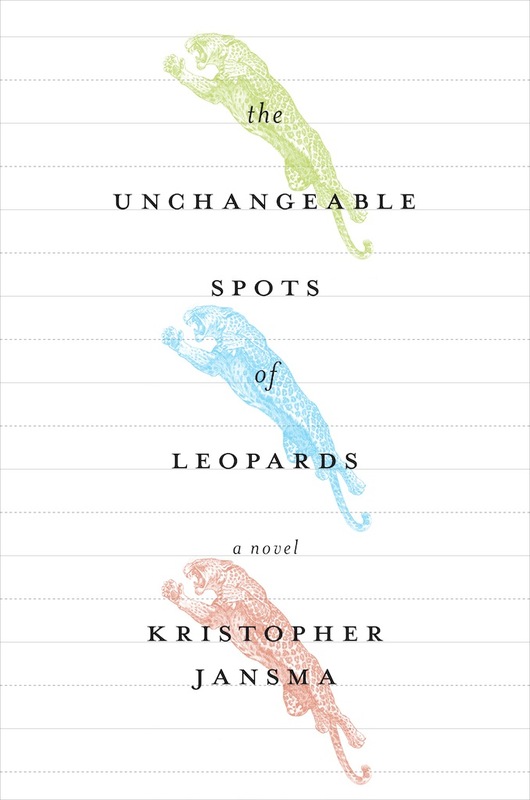 When Unchangeable Spots was first briefed, I jumped at the chance to work on it—I have a weakness for coming-of-age stories. But after reading the manuscript, I realized this novel was so much more. Told from the point of view of an unreliable narrator, it’s part illusion, part truth. It’s the story of three friends and their paths to adulthood, but it’s ultimately about the writing process and the nature of storytelling. In designing the jacket, I wanted something that referenced the writing theme, but also remained true to the experimental nature of the book. I also thought it might be fun to capture the sometimes volatile personality of Julian, one of the main characters. 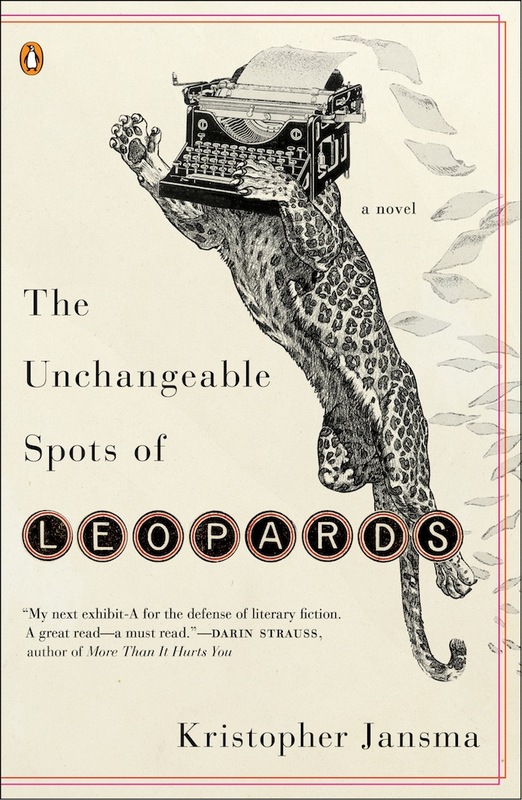 Enter crazy typewriter-headed leopard! It was my favorite of the first round comps but was not universally loved, so I moved on to other ideas. 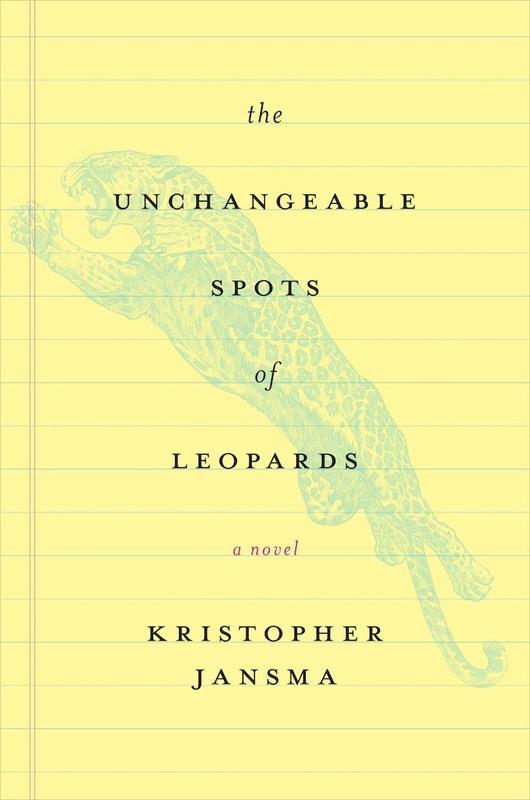 At first I tried desperately to keep the leopard, but the comps continued to be rejected. 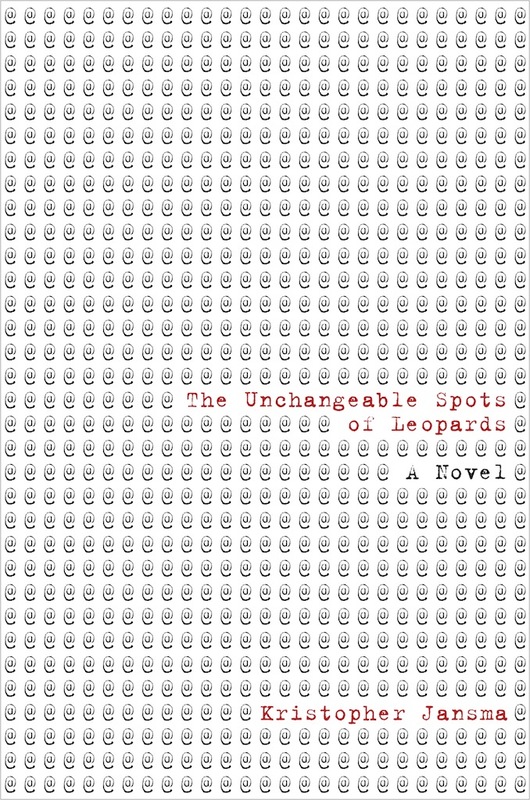 I decided to focus on one of my earlier concepts—finding a way to marry leopard spots with typewriter keys, both circular elements. Some early attempts were not so successful, but by playing with scale I was able to get something that worked and felt true to the book. I was glad that everyone involved was on board with the more subtle, abstract design and that we didn’t end up resorting to something safer or more generic. 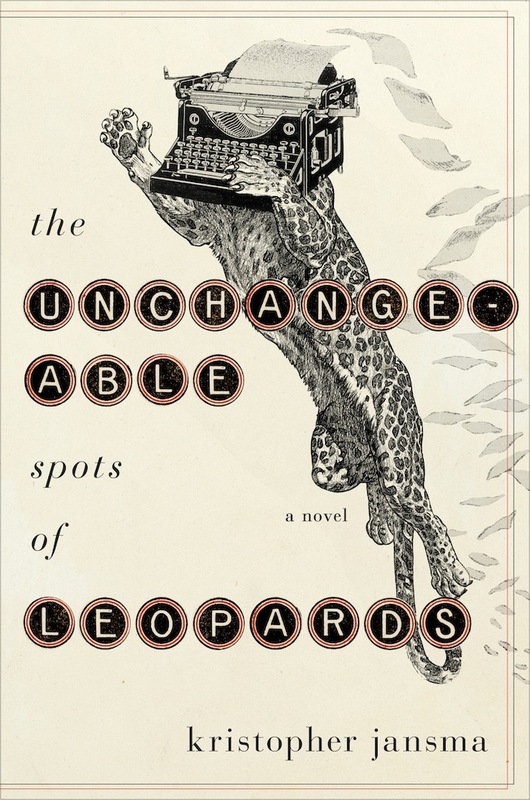 When the paperback edition came up for discussion, the typewriter leopard was once again under consideration. After adjusting the type treatment and adding a little color, we decided to go with it. It’s very rare that two designs I actually like will be used for the same book, so I’m thrilled with the outcome! Kris is a real talent and I truly hope my covers have done his work justice. The cover is fantastic. It caught my eye immediately and drew me to this book. I can’t wait to read it.